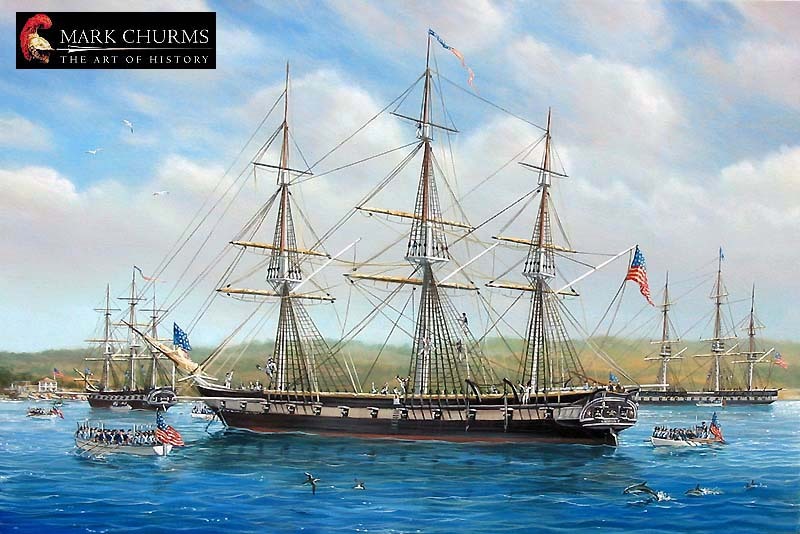 The great cities of California, San Francisco, Los Angeles, and San Diego all have histories that began with their harbors: all have substantial Maritime Museums which incorporate either historic or replica tallships into their programs to let the public experience the importance maritime history played in the creation of their cities. Monterey, pre-eminent of all the ports in California, needs a tall ship. And not any tall ship, but one that reflects a site-specific connection to this historic port. Monterey can have a ship that was here at the very birth of the state, a ship whose captain raised the flag of the United States at the historic Custom house, bringing California into the union. The benefit of a ship like the CYANE to Monterey goes far beyond the single episode of July 7th, 1846. Ships of this type, naval sloops-of- war, were the same class of ship that brought the great scientific and exploring expeditions of Spain, France, England, Russia, and the United States to California, and to the Provincial Capitol of California-Monterey; making Monterey a focal point of international studies much as it is today. Science, exploration, navigation, art history, international cultural studies, seamanship and programs that build team work and leadership skills could all be provided by such vessel for the benefit of school curricula and the community. It, of course, cannot be understated what a ship of this type could provide as a draw for tourism and increased visitation to the underdeveloped sites this proposal contains; as an interpretive center the former train station could be the gateway to the entire wharf area, as a ship building site it would greet visitors to Monterey with a tangible maritime structure that would connect the city to its harbor, and as a base for the programs mentioned above it would be a center for young people to experience maritime history and Monterey history in a way not currently available outside major metropolitan harbors. Our project is composed of the design, fund raising and building of a replica of the USS Cyane, a ship that was part of the Sloat landing on July 7th, 1846. The USS Cyane was a common sight along the coast of California in the mid 1800’s. In 1837, the Cyane and her sister ship the Levant were built from the same set of plans drawn up by Samuel Humphreys. The Cyane was built in Boston Navy Yard while the Levant was built in New York Yard. The ships were 132’ 3” in length and had a beam of 34’ 3” and weighed in at 792 tons each. Both ships were initially equipped with 18 carronades, 32 pounders, and 4 long 24 pounders; the latter were eventually replaced with 4” shell guns. Later in her career a spar deck was added to the Cyane, even with this added weight she proved to be a fine sailing ship and was well liked by her crew. She sailed 24 June 1838 for duty in the Mediterranean, returning to Norfolk, Virginia 16 May 1841. 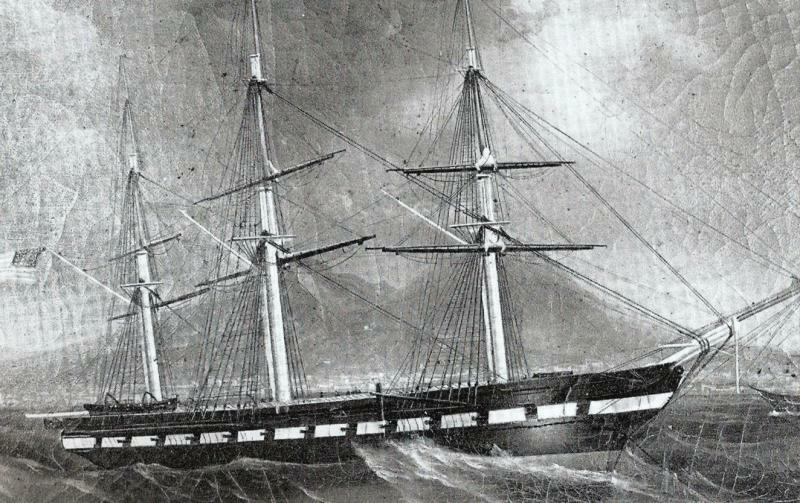 She cleared 1 November 1841 for the Pacific Station, returning 1 October 1844. 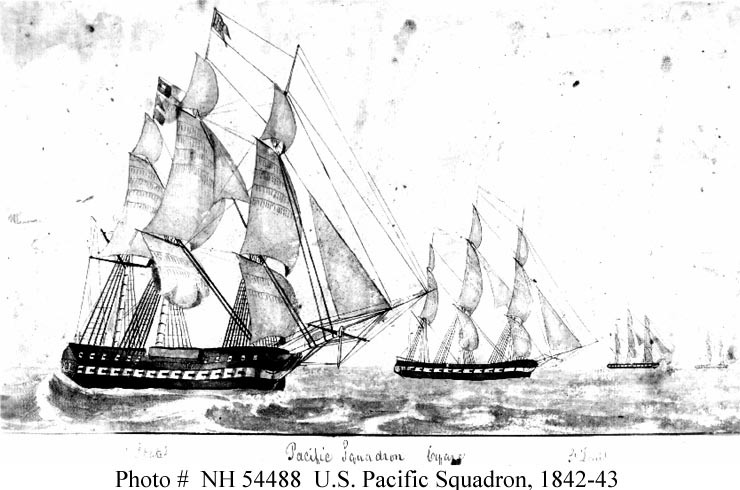 Sailing again for the Pacific 10 August 1845, Cyane served on the west coast during the Mexican War. 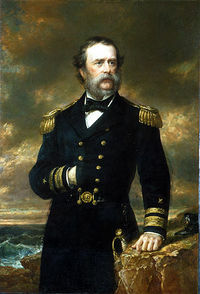 On 7 July 1846 her commanding officer, Captain William Mervine, led a detachment of Marines and sailors from Commodore John D. Sloat's squadron ashore at Monterey, California, hoisting the American flag at the Customs House and claiming possession of the city and all of upper California. On 26 July 1846 Lieutenant Colonel John C. Frémont's California Battalion boarded Cyane, now under the command of Commander Samuel Francis du Pont, and she sailed for San Diego, California 29 July. A detachment of Marines and sailors from Cyane landed and took possession of the town, raising the American flag. They were followed shortly by the Fremont volunteers and Cyane's detachment returned aboard to sail for San Bias where a landing party destroyed a Mexican battery 2 September. Between 9 October 1851 and 24 June 1852 Cyane sailed in the Home Squadron, rejoining it 10 October 1852 to cruise constantly on the Atlantic coast and in the Caribbean from Nova Scotia to Aspinwall for the protection of the lives and property of American citizens. She bombarded and destroyed San Juan del Norte, Nicaragua, 13 July 1854 in retaliation for actions against American citizens there, and protected the disputed fisheries along the coast of Nova Scotia from 2 September to 30 October 1857. She sailed for Haiti 19 November 1857 and joined a special expedition surveying the Isthmus of Darien as a possible canal site. In August 1858 Cyane stood out for the Pacific, and except for necessary overhauls, was constantly employed on the coasts of North and South America until decommissioned and placed in ordinary at Mare Island Navy Yard 20 September 1871. She was sold at auction 30 July 1887. The size and historical connection with California make the Cyane an ideal candidate for this project. Original plans still exist in the National Archives and several copies have already been received and are under study at this time. The prospect of building an accurate and well detailed replica is excellent and we feel there is a great probability of success for this endeavor. Once complete we would work with the city of Monterey to secure suitable docking space and access that would allow easy access for both crew and visitors. There is an excellent section along Wharf Number 2 that may be ideal for this purpose and would require minimal upgrades for this rarely used space. The Cyane would be classified as a Sail Training ship and would cater mainly to schools, at risk youth programs and sectors of the public with that particular interest. We feel we would not be in competition with current tour boats and excursion companies in that we would offer a more hands on experience that would not appeal to many casual tourists or participants. We have divided this segment of our proposal in to sub categories and steps so as to provide a clear path for this project. Phase 1: We would only have one chance to get the design and construction correct. This phase of step one would be the most critical and would decide success or failure of the project. We would first need to identify and procure plans and any available artwork and information regarding the Cyane and her history. Plans, as mentioned above have been found at the National Archives and we have ordered several pages and are currently twenty five percent complete on this phase of step one. Phase 2: With the completion of phase 1, we will commission a master model builder to build a scale model of the Cyane to be used as reference and project promotion. This model will be assembled by the master and volunteers. Cost of step one will be four thousand, eight hundred dollars. With the completion of step one, we can begin our search for a qualified ships architect who can provide a set of working plans that will conform to current required safety and coast guard specifications. Authenticity will be greatly stressed after the previous standards are met and complied with. The cost for a set of plans for a custom yacht is normally 5% of the construction cost of the completed vessel. We will meet and work with officials from the city of Monterey to identify and secure a pledge for use of a suitable construction site near the wharf. The old Train/Greyhound station would be ideal as it has easy access to the wharf and has buildings on site for storage. Also the building of a historical ship would be a great attraction to the area as it would be visible from Del Monte Ave, a main thoroughfare between Monterey and Pacific Grove. This location would encourage visitors to park at the wharf parking area and after visiting our facility, visitors would most likely continue to the main wharf. We would make use of bleachers to provide public viewing of the ship being built as well as volunteer historical interpreters to release public information and an onsite gift shop. With a pledge of the site in hand our fundraising would begin and we would begin to interview master shipwrights to head the project. It should be mentioned that we currently have several consultants who have worked with other Maritime Museums and Tall ships and they will assist us in securing the best Architects, Shipwrights and Crew for this project. Fundraising would be without a doubt the most difficult part of the project. There are grants available that would provide funding for apprentice shipwrights to work under a master shipwright during the construction; however this would be only a fraction of what is needed, the bulk would have to come from public and business donations. Many such replica ships have been built so the interest and funds are out there. We would need to rely heavily on the media to get publicity for our project and ensure that anyone interested would have full knowledge of what we are attempting. It is critical during this phase to maintain a certain amount of public enthusiasm and excitement so the project does not get forgotten. When the project funding seems to be moving well forward we could start the construction with one third funding rather than wait for full funding and risk loss of interest. The beginning of construction with the ship taking shape would ignite further enthusiasm and garner more media attention, no doubt on a national scale. A well laid out and informative web site would be crucial and is already being planned at the moment. Estimated cost of construction is eight million dollars. This phase would be the actual ship construction itself, a master shipwright working with the Project Director, several fulltime apprentices and volunteers would layout and begin the construction of the hull at the site provided by the City of Monterey. A temporary steel awning would shelter the project and provide lighting at night, while open sides would provide ample public viewing. When the hull is at a suitable phase of construction the awning will be removed and a marine travel lift rented to move the hull to a closer location at the wharf where a crane will lift the hull into the water. Once in the water the hull will be towed to a location along the wharf where the masts, rigging and interior can be completed. This is the completion of our project and the beginning of an exciting time for our community and visitors alike. As always our main focus is education and community outreach. With the ship designated a sail training ship by the U.S Coast Guard we will strive to maintain our educational and At Risk Youth Programs. Schools would have access to our dockside programs as well as sea going excursions for smaller groups of students. To fund our program and maintain the ship we would have sail training programs for the general public of various lengths and work to create a “Friends of the Cyane” membership base to provide funds on a regular basis in return for discounted access and sail apprentice programs. We would also sail to local coastal cities to increase public awareness of our ship and program and encourage them to visit our ship and local landmarks at our homeport. The benefits to our local economy provided by an impressive, media attention grabbing ambassador such as the Cyane would be greatly appreciated here on the central coast. The following are programs to be implemented upon completion of the ship. Introduction: Today’s young people can face many challenges from poverty, drugs, gangs and dysfunctional families. This age is a critical time and decisions made now can affect the youth for the rest of their life. Sail training programs have been used for many years with great success around the country. A ship is a world unto itself and cannot function unless the entire crew pulls together. Participants quickly learn this fact and make dramatic efforts to be part of the crew and family while onboard. Objectives: During this two week program the trainee would learn the ropes and be given increasingly more challenging and difficult tasks, all the while building confidence and self esteem. The ultimate test and accomplishment is going aloft to work the sails many stories above the main deck. This rite of passage brings a great sense of accomplishment and satisfaction and the results of this program on similar ships have proven to be amazing. Costs: The discounted daily rate for the ship $1,000; would be divided by the number of students participating. We are estimating 20-30 students can be accommodated on a daily basis and the daily cost would be divided by those participants. Ideally we would get corporate sponsors or donations from the general public to offset these costs so that we may reach out to more youths interested in the program. Introduction: This dockside program would give many their first glimpse into a rarely seen world. Students would be broken up into groups and under close supervision, learn compass use, navigation, rope work, arts of the sailor, period history, cannon drill, rigging, etc. This would follow with a period lunch given on board on the Berth Deck in an authentic setting. By special arrangement the students can then be taken on a short sail to observe the ship in action. Objectives: This program would strive to bring a sense of excitement to the schools current historical programs andgive the students a better understanding of the benefits and hardships experienced by the sailors and common citizens of the period. Costs: The dockside program would be available free for all schools that are interested. Donations would be accepted, but not solicited. Those schools that would like to have a day sail on the bay as part of their program would be charged a discounted daily rate $1,000; which they can then divide by the number of participating students. Corporate sponsors could donate their guest passes to schools to offset the cost of the sail. Introduction: Anyone who has everseen the Special Olympics cannot help but be moved by the dedication and determination displayed by the participants. Their “can do” attitude and sportsmanship provide a fine example and inspiration to all involved. Objectives: We would like to set aside certain times of the month to cater to these special needs individuals and provide a day of sail training and excitement. Teamwork, history of the ship and naval traditions will be stressed and taught in a relaxed and stress free manner. Parents and immediate family members would be asked to participate as well. Costs: We would like to offer this program at no cost for the individuals involved and their families. Introduction: Women only sail training has been extremely popular on other sail training ships. These excursions allow a personalized pace to be established and tend to be free of distractions experienced on mixed crews. Objectives: we would like to provide a day of sail training, the historical context of women at sea, history of the Cyane and some basic naval traditions. Emphasis would be on teamwork and self confidence building. Costs: A three hour sail training trip would be $60 per person based on 20-30 participants. Raising funds to operate the ship will be a fulltime effort and necessary to keep our educational and other programs going. Generally the ship would be available for dockside tours in the mornings with sail training on the bay in the afternoon to take advantage of better wind conditions. This would not be a leisure trip where participants sit and watch the crew, rather the public would be encourage to lend a hand working with the crew. These sail training excursions have proven very popular and visiting tall ships are always sold out for these events. Generally the cost per person for a 3 hour sail would be $60. Also we would offer two week long programs to who are interested in a more in-depth sail training experience. Participants in this two week program would perform daily tasks alongside our regular crew and would be trained in all aspects of sailing expected of a basic seaman; the cost of this program would be $600 per week. For those unable to make a full two week commitment, we would allow them to proceed at their own pace on weekends until the full time period and training is complete.